What would you do if everything you thought was true about your family turned out to be a lie? Christie Craig welcomes readers to the Texas Justice series with a chilling suspense. Don't Close Your Eyes will keep readers guessing from page to page while falling into a romance right along with our hero and heroine! The newly discovered remains of a young girl brings Annie Lakes' nightmares into hazy focus. 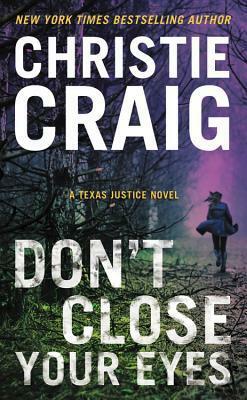 Seeing one of her cousins again at an uncle's funeral pushes her to visit Detective Mark Sutton, who works on cold cases with surprising success. When she tells her story Mark thinks she's crazy, but still he makes a few calls. A few snatches from Annie's confused memories, and physical attempts on her life, turns into a hunt for a murderer. By this point I'm already intrigued and there's no turning back! Annie and Mark are complex characters that take the story to a deeper level. Their pasts and imperfections carry weight in the kind of characters they are and it makes it hard not to become invested in their story's outcome. From where the story started I didn't expect where it would end. As more details were revealed about the case, the more I got a feeling in my gut that this would not end well. It didn't get as dark or sinister as I expected, but the tension was definitely there. I actually held my breath during a few scenes! The 'whodunit' reveal was a bit anticlimactic but overall I was surely kept in suspense to the very end. Can't Get Enough of Carolyn Brown's Cowboys! Clear Your Shelf Giveaway - Enter to win BIG! FIRST LOOK: Forever Theirs by Katee Robert!